As part of a series of collaborations which are the output of the REPESEA project under Erasmus +, February 18-19 2019 the Master of Science and Doctoral Program of Faculty of Economics and Business, Universitas Gadjah Mada (MD FEB UGM) conducts the Global Outreach Program. This activity is in collaboration with Universiti Teknologi Malaysia (UTM), Azman Hashim International Business School (AHIBS), and Public Health Position, Negeri Sembilan (JKNNS), Malaysia. 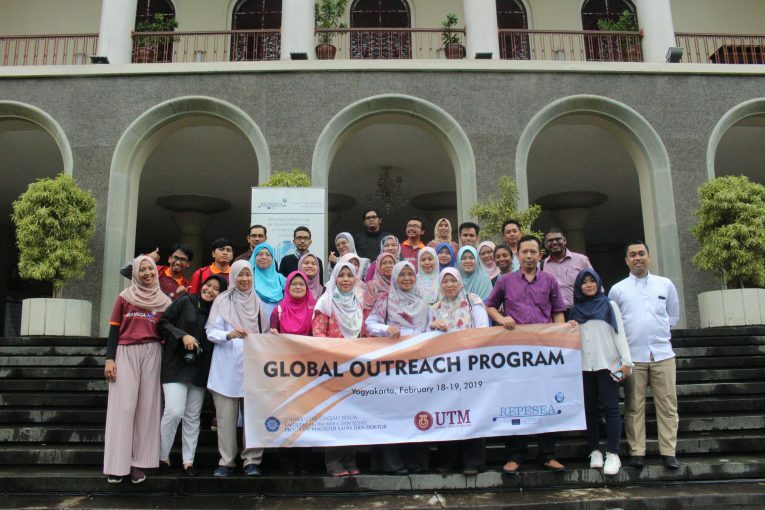 The Global Outreach Program was themed “Going Global in Healthcare”, which was held for two days in Yogyakarta, Indonesia. On the first day, the event was held at MD FEB UGM. The event was opened by Prof. Catur Sugiyanto, as one of the directors of MD FEB UGM. In his opening, Prof. Catur gave an explanation regarding the general description of the MD FEB UGM program, along with a number of dual degree programs offered. On the next occasion, Assoc. Prof. Dr. Rohaida Binti Basiruddin from AHIBS UTM also provides exposure to the general description of AHIBS and UTM. The exchange information is carried out in order to build opportunities for new collaborations between UGM and UTM, and/or specifically MD FEB UGM and AHIBS UTM in the fields of education and research. The next agenda is a guest lecture related to Indonesian Healthcare. This guest lecture was given by Prof. Dr. Laksono Trisnantoro, M.Sc., Ph.D. from the Faculty of Medical UGM by presenting two topics in two different sessions. The first session was filled with the topic “Indonesia Health Reform: Implementation of IR 4.0 in healthcare Management”, while the second session was filled with the topic “The Implementation of Casemix and Health Insurance Models in Indonesian Hospitals”. At the end of the lecture, a token of appreciation was given to Prof. Laksono as the speaker, and also to Prof. Jogiyanto, Prof. Chess, and Nurul Indarti, Ph.D as the directors of MD FEB UGM by UTM. As the host, MD FEB UGM also gave a token of appreciation to Prof. Rohaida as the representative of UTM. On this occasion, the group from UTM also took the opportunity to conduct a campus trip in a number of places in MD, FEB, and UGM. The campus trip begins by looking at the new building of FEB UGM, namely the Learning Center Building. From the student rooms to the library of FEB UGM became the destination visited by the UTM. After the Learning Center Building, the UTM group continued the trip to FEB UGM, and stopped in front of the main entrance of the FEB UGM to take a photo together. The last spot that was visited and to take a picture together was the Balairung, which is the main hall of UGM building.